The Lassa virus is the causative agent for Lassa fever that is serious ailment sometimes leading to death. This disease is a so-called “hemorrhagic disease.” Lassa fever is prevalent in West Africa Currently there is no vaccine available for this disease. According to the Center for Disease Control and Prevention (CDC): “Signs and symptoms of Lassa fever typically occur 1-3 weeks after the patient comes into contact with the virus. For the majority of Lassa fever virus infections (approximately 80%), symptoms are mild and are undiagnosed. Mild symptoms include slight fever, general malaise and weakness, and headache. In 20% of infected individuals, however, disease may progress to more serious symptoms including hemorrhaging (in gums, eyes, or nose, as examples), respiratory distress, repeated vomiting, facial swelling, pain in the chest, back, and abdomen, and shock. Neurological problems have also been described, including hearing loss, tremors, and encephalitis. Death may occur within two weeks after symptom onset due to multi-organ failure. 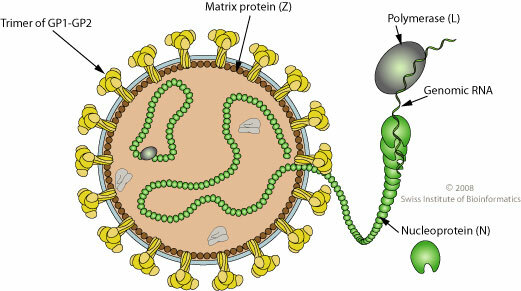 The Lassa virus is a member of the class of single-stranded RNA viruses within the arenavirus family (see image below). It possesses a rather simple structure with only one glycoprotein on its surface – GPC. The function of this protein is to preferentially bind to its host cell target that are primarily the epithelial cells that line the blood capillaries. Dr Kathryn M. Hastie from and her colleagues from the Scripps Research Institute in La Jolla, California were interested in studying the binding of neutralizing antibodies obtained from a human survivor of Lassa fever with GPC in order to gain some insight in regards to the structure of GPC and the virus’ manner of entry into the host cell. Elucidating this mechanism would provide significant insight into the development of an effective vaccine against this horrific disease. GPC in its configuration on the virus particle (virion) exists as a trimer each containing a receptor bind subunit (GP1) and a transmembrane subunit (GP2). Once binding via GPC is successful and the viral RNA successfully gains entry into the host cell, it commandeers the host’s cellular machinery within the cytoplasm leading to the production of infectious virions – a process that leads to cell death and release of the viral progeny that go on to infect neighboring cells. In order to elucidate the structure and organization of GPC on the viral surface, the research team studied, “more than 100 antibodies from human survivors of Lassa fever.” This investigation lead to the discovery that the majority of antibody responses targeted the entire GPC assembly rather than individual subunits. High resolution images of the antibody-GPC complex were derived from X-Ray crystallography. These data provide information essential for the development of an effective vaccine for this virus.